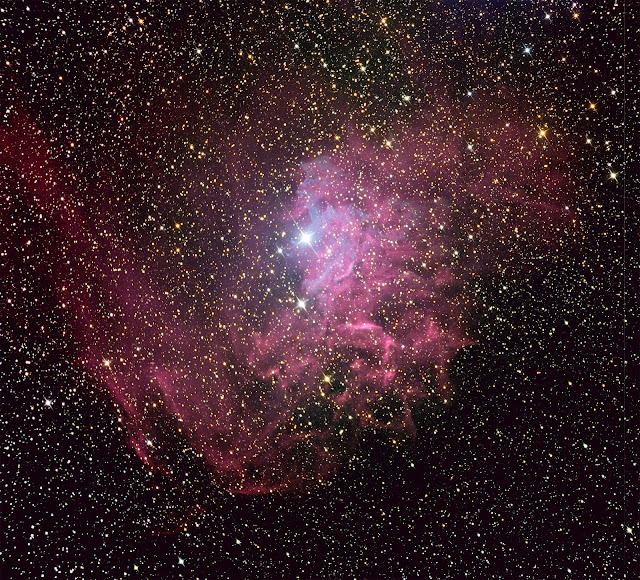 This Insight Observatory "Feature Deep-Sky Object" post highlights the emission/reflection nebula, IC 405 - The Flaming Star Nebula, located in the constellation of Auriga. On the evening of December 22, 2017, Insight Observatory's managing member and project developer, Michael Petrasko was remoted into their Astronomical Telescope for Educational Outreach (ATEO) system downloading data from a previous observing run to gather image data requested from users utilizing Insight Observatory's ATEO Public Image Request Form. The sky conditions were pristine and as Michael was wrapping up with his tasks, he figured; why not take advantage of the weather conditions and image an object he has never imaged or visually observed through a telescope before. by Michael Petrasko and processed with PixInsight 8.1 by Muir Evenden. Browsing through the open-source planetarium software, Stellarium, Michael spotted a deep-sky object that was placed perfectly in the sky for imaging out in New Mexico where the remote telescope system resides. He then proceeded to acquire 10 images at 120 seconds each with the Luminance filter and 5 120-second exposures each with the Red, Green and Blue filters. 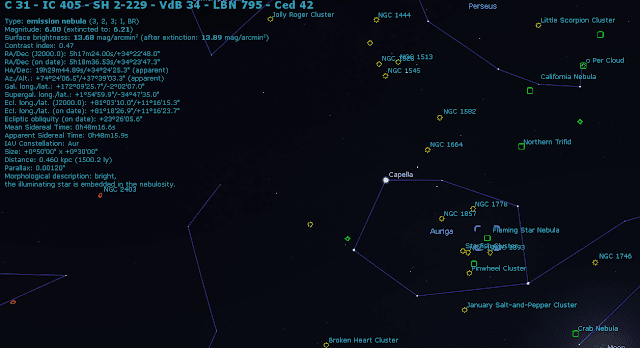 IC 405 shines at magnitude +6.0 and surrounds the irregular variable star AE Aurigae. It is also located near the emission nebula IC 410, the open clusters M38 and M36, and the K-class star Iota Aurigae. 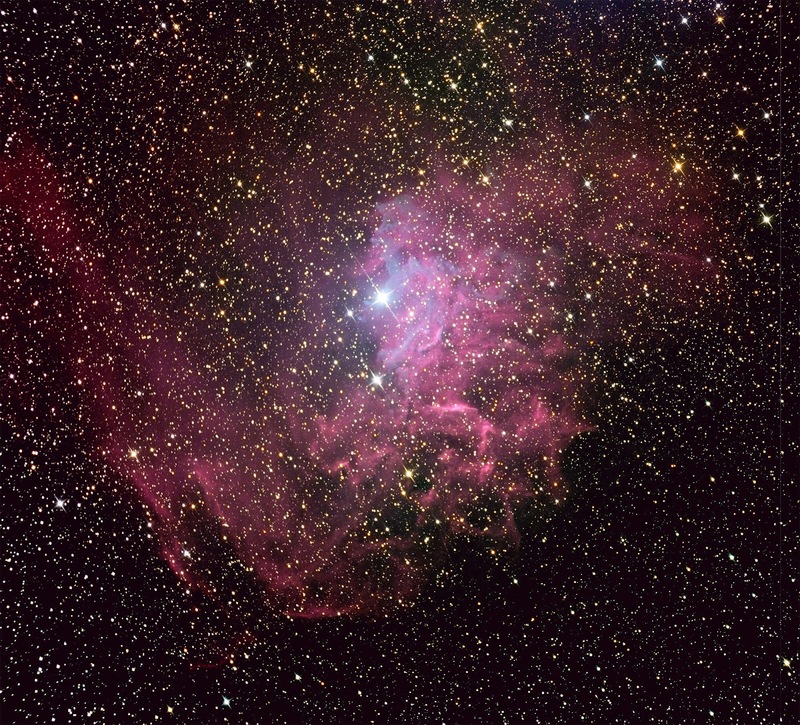 The nebula measures approximately 37.0' x 19.0', and lies about 1,500 light-years away from Earth. It is believed that the proper motion of the central star can be traced back to the Orion's Belt area. The nebula is about 5 light-years across. 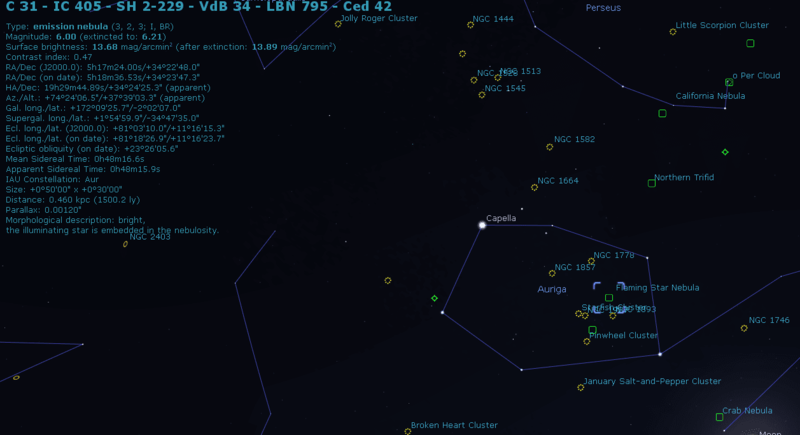 Location of IC 405 - The Flaming Star Nebula as displayed on Stellarium. The full resolution image of IC 405 can be viewed on Insight Observatory's Image Gallery. If you are interested in imaging deep-sky images like this using the Astronomical Telescope for Educational Outreach (ATEO), please visit the ATEO Image Request Page for more information.